With the move into karting Group Lotus becomes the first car manufacturer to have a presence at the entry level of motorsport and provides a very special opportunity for early talent spotting. Some of today’s most famous and successful motorsport personalities cut their teeth in karting – the newly crowned FIA F1 World Champion Sebastian Vettel is the perfect example of the benefits of early driver development as are his peers, fellow former World Champions Jenson Button and Lewis Hamilton.But Lotus isn’t just interested in spotting the driving talent of the future, the potential to work with young people showing an aptitude for design and engineering is recognised as a very special opportunity for Lotus. Competing under the ‘Lotus Racing Karts’ banner and forming part of the Lotus Motorsport division, Lotus Racing Karts will field a factory backed team, operated by Jefra Racing out of its headquarters near Treviso, Italy. With a formidable racing pedigree spanning over 40 years, Jefra Racing has competed in many classes of motorsport. Lotus hopes that this invaluable experience teamed with leadership from Team Manager Franc Jerancic will form the basis of a truly competitive team. And Franc Jerancic is the man to impress – talent spotted and recruited by him will have all the latest homologated material at their disposal, including two new chassis models ‘Colin C30’ and ‘Jimmy C32’ giving the Lotus Racing Karts team the edge as they take on the CIK-FIA international karting events for KF and KZ categories and the World Karting Championship for KF1 category. 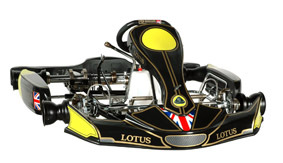 The production of karts and components is licensed by Group Lotus to Wildkart, specialists in aeronautics precision engineering since 1996 and manufacturer of karts since 2002. Today, Wildkart is regarded as an authority in kart chassis and components, providing services and solutions to many karting suppliers and brands. The fit with Group Lotus is enhanced by the mutual commitment to innovation, technology and development.“Our entry into karting is exciting on many levels” comments Miodrag Kotur, Director of Operations for Lotus Motorsport. “Not only are we nurturing new talent and widening our motorsport programme, but we also have an opportunity to join forces with two world-class specialists. It is exciting to see Lotus Motorsport grow in such an authentic, fresh and exhilarating way”Lotus Racing Karts will unveil their 2012 karts at the annual AUTOSPORT International event on the 14th January 2012 at NEC - Birmingham, UK.